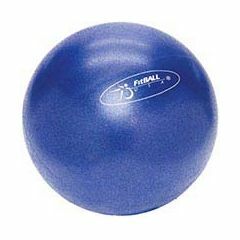 The FitBALL Mini is a 9" inflatable ball used for resistance work in Pilates and other mat fitness programs. The FitBALL Mini is also a wonderful tool for adding focus and energy to your workouts. In addition, it can be used slightly deflated as a soft prop under the head, neck, feet, back, etc. Dark blue color with soft, easy-grip texture. What Types of Exercises Can Be Done? Sturdy Construction. Gym Quality. Durable. High Quality. Good Value. Good Grip. Versatile. Improving Core Strength. General Fitness. Rehab. This FitBall is so versatile I even travel with it! It is a must have for any one whether you are a trainer or a student. Improving Core Strength. General Fitness. Weight Loss. Rehab. I bought these balls for my barre class- they are the perfect size and durability for the exercises we do on mat for floor abs. I use a FitBall mini at physical therapy, and purchased one for home use. Sturdy Construction. Gym Quality. Durable. Good Value. Good Grip. Versatile. Balance exercise and many more exercises, portable-take on trips for play or exercising away from home. For Seniors-to lift above your head, side to side, bouncing, just to name a few. Sturdy Construction. High Quality. Good Value. Good Grip. Versatile. Durable. Gym Quality. Perfect size. Improving Core Strength. Rehab. Weight Loss. General Fitness. Avid Athlete. Pilates and fitness instr. Pilates and fitness instr. Really fantastic for core work! And for people that can't lift their head to do ab work, but they can do abs by lowering and lifting legs with the ball between calves! Do you need a pump to inflate the ball? I am going on a trip and need to pack a ball and i want a ball I don't need a pump to inflate. A pump is not necessary, the ball can be inflated by mouth without too much effort. Is the same size as the Silver Sneakers Ball? I am not familiar with the SS ball. All I can tell you is that the 9" fit ball is perfect size for ballet bar classes. These balls fit nicely behind the knee when exercising the hamstrings. .